More highlights of the last two weeks…. 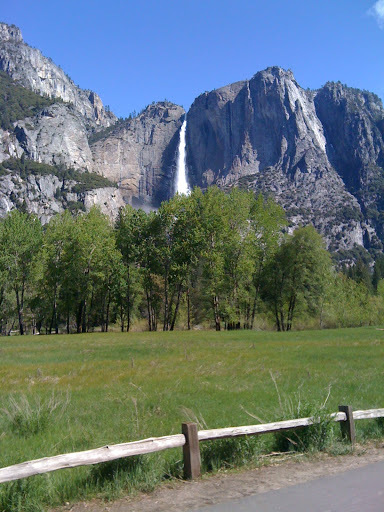 Yosemite Falls, 2,425 feet 5th tallest in the world. I hiked this when I was younger. Most memorable moment of hike was when the hat that I had just bought blew off and my heroic Dad was about to reach under the guard-rail and get it, when God stepped in and blew it down the falls! The earth is the LORD’s and everything in it, the world, and all who live in it; for he founded it upon the seas and established it upon the waters. Half Dome, my old friend. Hiked to the top when I was 14, 16 miles round trip, with an elevation gain/loss of 5,131 feet, elevation at the top is over 8,000 feet. The last part is reached only by steel cables….believe me, you need both hands! How many are your works, O Lord, In wisdom you made them all; the earth is full of your creatures…. When you send your Spirit, they are created, and you renew the face of the earth. Houses bordering Yosemite meadow. Many years we have walked by these little houses facing the most beautiful view in the world and thought, who could be blessed enough to live here? This year we were treated to this particular flowering tree we have not yet been able to identify…..
Let the fields be jubilant, and everything in them. Then all the trees of the forest will sing for joy; they will sing before the LORD, for he comes, he comes to judge the earth. He will judge the world in righteousness and the peoples in his truth. 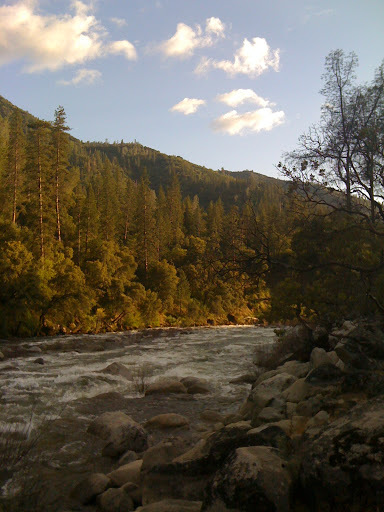 The mighty Merced River, view from our balcony at Yosemite View Lodge. My folks and my brother generously treated us all to the 2 bedroom suite, what a wonderful gift! The first night, I thought the furnace was running so I got up to check, but it was the noise of the river, even with windows closed you could hear it! For since the creation of the world God’s invisible qualities‑his eternal power and divine nature‑have been clearly seen, being understood from what has been made, so that men are without excuse. 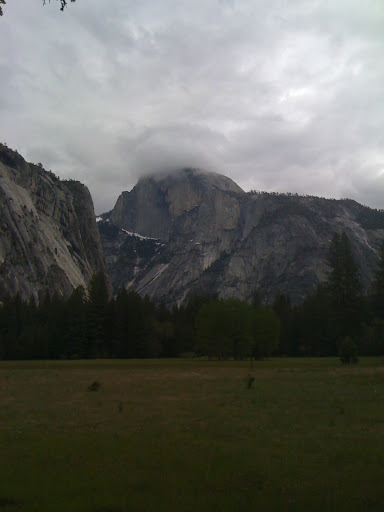 Yosemite is one of those places that is grafted into my soul, having spent so much time there growing up. I encourage you to go if you haven’t been….it is one of those places that you really must see for yourself. To hear the Stellar’s jay call, the sigh of the pines, their tops bending to the wind, the echo of tent pegs being pounded in as camp is set up, all against the backdrop of those wondrous vertical granite cliffs rising straight up off the valley floor….An experience like no other. Thank you for coming along on my journey! This entry was posted in Family, God, Nature. Bookmark the permalink. ← Grateful for our freedoms…..
Oh the memories. 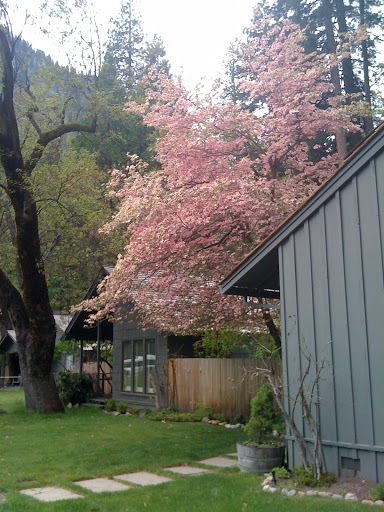 Our family stayed in this very lodge overlooking the Merced River. The rooms were really great — big tub, fireplace, small kitchenette, balcony over the water. From there I had coffee and sketched the birds that I saw each morning. We stayed there a week. The vistas in Yosemite are like something out of a fairy tale. So beautiful it's hard to believe they are real. How wonderful that you know the place. I so enjoyed getting up before everyone and sitting out on that deck! Yes, so many memories, imagine a little “picket fence” church going family right in the middle of the hippie movement in Yosemite during the sixties, that was us! So many hippies lined Stoneman bridge it was solid bodies….we have been through many eras in that park. Ahhh.